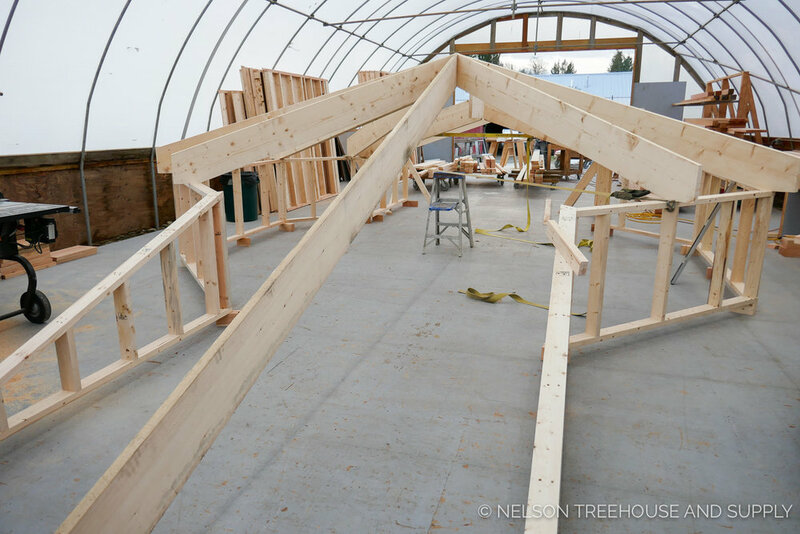 Our crew framed the roof for the Treetop Honeymoon Suite inside the prefabrication shop, before dissembling and shipping it to the build site. The octagonal shape and sloped back portion made for a creative prefab process. The completed roof was topped with red standing seam metal. Huxley the Bernese Mountain Dog helps carpenters Griffin and Ian frame the roof. Shop drawings display labels for components. These are marked accordingly once cut and assembled in order to streamline reassembly onsite. The long, sloped back section flows directly from the octagon. The prefab crew dealt with many distinct slopes and angles in this roof. A handy equation for finding the octagon hip pitch is [unit of roof rise] over 13. For example, if you have a 6/12 roof pitch, your octagon hip pitch will be 6/13. The crew almost always doubles the hips to make it easier to cut the backing angle. Plus, it provides a larger nailing surface and additional strength. "As I watched the episode I chuckled at how we put it together and thought to myself, why didn't we use a block in the middle instead of cutting cheek cuts like we did. If you look again I think you'll find (it's been a while since we cut this package) that we had two king rafters and then two rafters coming off of them at 90 degrees and then the four intermediate rafters cut with 45 degree cheeks, and finally eight hips. I think the deep cheeks you saw were the center rafters of each roof plane. And I find myself chuckling again as to why we took the time to cut the cheeks and didn't just cut them square, on the roof pitch and slam them into place and screw them off (since they were ultimately hidden behind the sheetrock). Oh well, hindsight, as they say. The only thing I can think of is that I tend to lean towards Will Holladay's book A Roof Cutter's Secrets and this is one of the ways he teaches. He shows other ways as well but this is the way we chose for this one." Photo courtesy of Shane ROBINSON. 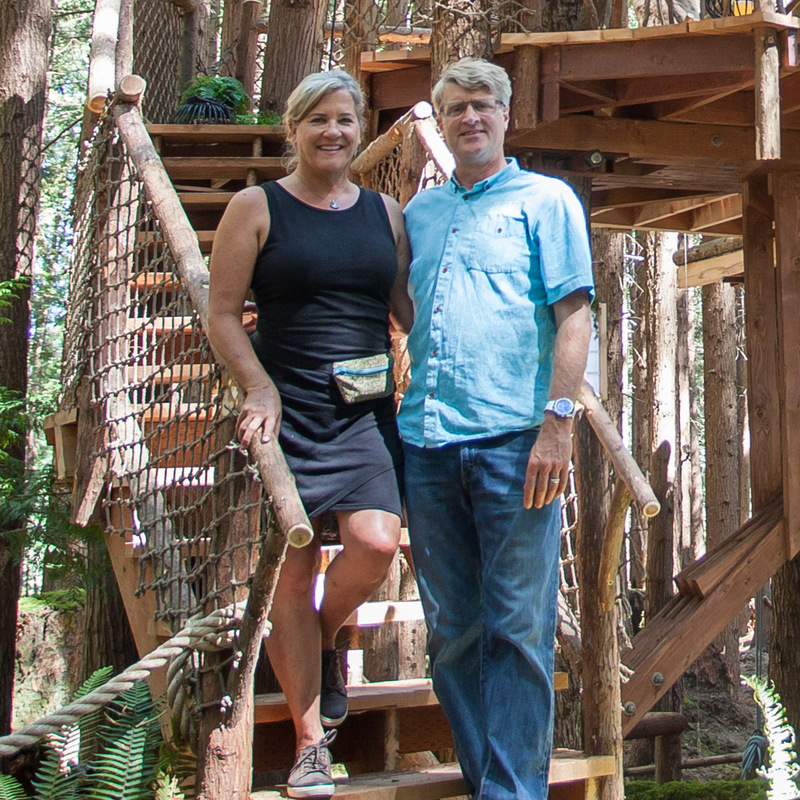 We hope you've enjoyed taking a look at the prefab process behind the Treetop Honeymoon Suite! 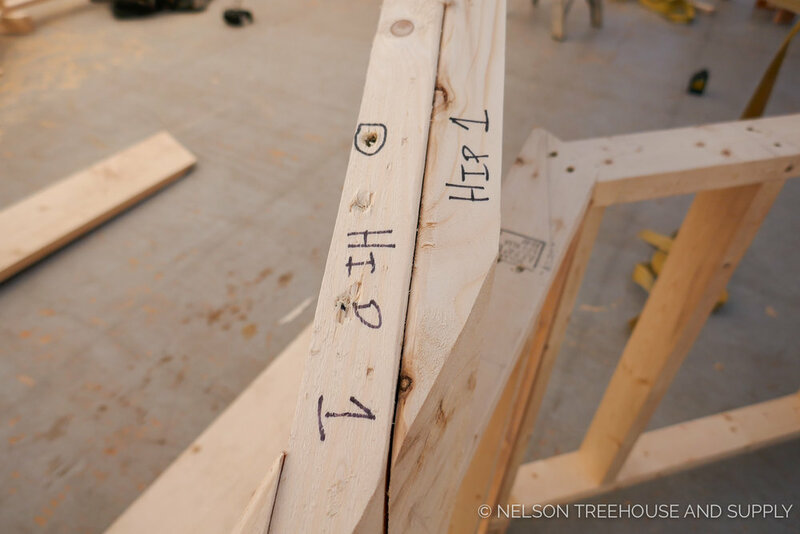 Stay tuned for more glimpses of the prefab process behind the treehouses in this all-new season of Treehouse Masters.